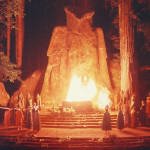 What is Bohemian Grove? And what takes place there? Infowars’ Alex Jones answers these questions in his 2000 expose of this secret meeting place of the global elite and discusses its significance in regards to the New World Order. Located in a 2,700 acre redwood forest outside of Monte Rio, California, the Grove is the site of the annual two-week long gathering of the “Bohemian Club”, which was formed in 1872. This mysterious all-male club has boasted many notable high-ranking members including both former President Bushes, Regan, Nixon, and Dwight D. Eisenhower, Taft, Hoover, Clinton, to name just a few. 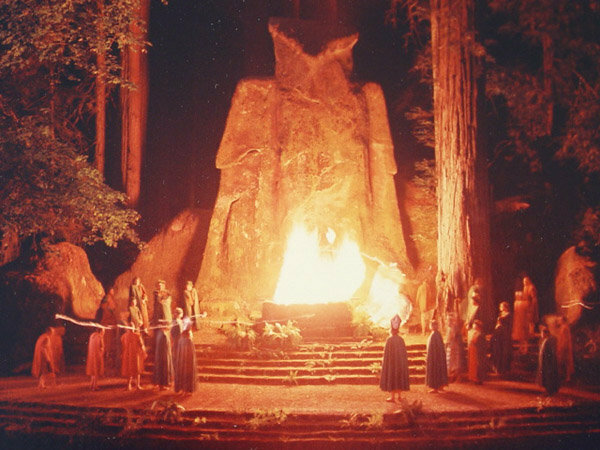 The Federal Reserve is run by members of the club, and participation in Bohemian Grove freakishness is required of any man who will become President. The first 53 minutes are Alex Jones preparing for the infiltration and speaking with local residents to hear their reactions to Bohemian Grove. He then accomplished what no one else before him had ever done by capturing video footage inside the grove, including the Great Owl statue that is the focal point of a very disturbing ritual called the Cremation of Care. Witness this undeniably occultic ritual which Jones claims research indicates it is a combination of the Babylonian Canaanite cult of Moloch (an owl deity) melded with ancient Druidic as well as Scottish Masonic rituals. During the bizarre ceremony, where the participants don KKK style robes, they perform what is assumed to be a mock human sacrifice, although Jones seemed unclear as to whether it was an effigy or a real sacrifice, since you hear the bound victim screaming. Whether real or fake, it is disturbing to think this is what the leaders of our country are participating in.